Keri No Chundo, incredibly delicious Gujarati style pickle can be found in most of the Gujarati Kitchens and Thali. It's so sweet, spicy and a little sour ,it has all the flavours which your taste buds crave for. While I spent my childhood in India, this time of the year my mum would start preparing various kind of Mango Pickles including Keri No Chundo. I never saw her sitting with the recipe books or weighing scales. Lol, her two hands were enough to judge. She would just get on with it. On a chosen day she would brave the sweltering heat and catch a bus to a special fruit and veg market, choose all the right variety and amount of mangoes and return with them in a bus home. As soon as she comes home, in hour she would start making pickles and we sibling without being asked anything, start helping her and obviously enjoy munching on raw mangoes with little salt and red chilli pepper. My favourite time would be when she starts preparing for Chundo , btw Chundo translates Mashed and in Gujarati lingo we pronounce Chundo NOT Chunda . 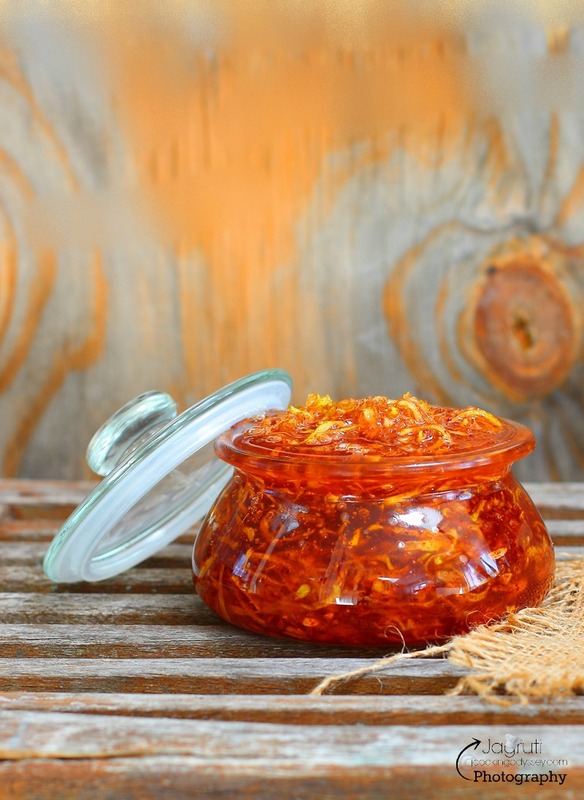 Mum always made Chundo in the heat of the sun, traditional and authentic way where Chundo ripens in the heat of the sun and can take up to 8-10 days to prepare. I would do anything to help my mum, in a month of May I take great care of taking up and bringing back those stainless steel Pans full of Chundo covered and tied with White muslin cloth and while the Chundo is being made, sneakily I would wolfed down couple of spoons now and then even if it wasn't ready to eat. If you want to learn making Indian Pickles, I would prefer you to make Keri No Chundo simplest amongst all the others. 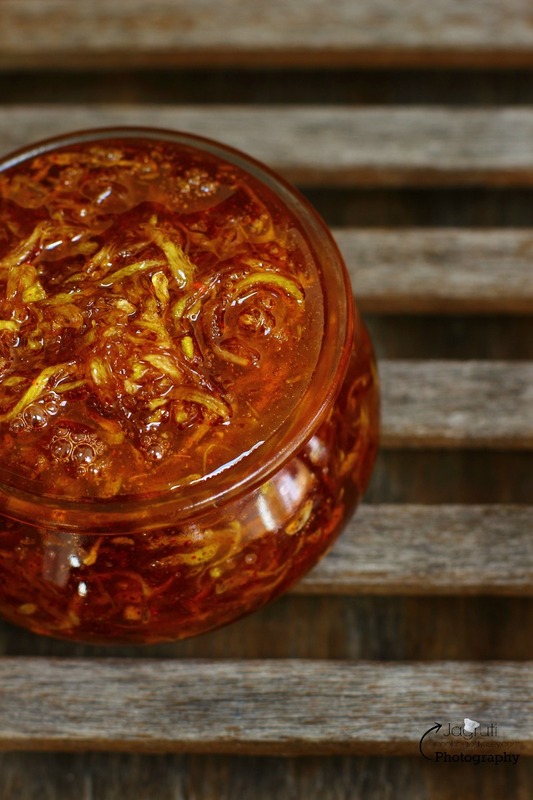 This recipe do not require much skills , just follow some measurement and leave the rest to the scorching sun , yep without that you can not succeed in making traditional chundo. So, what happens when the sun always plays hide and seek, simply ditch this method and run to the super store and buy a bottle of Chundo, with six month's expiry date which is no way near look wise or taste wise as home made. Not really, actually Keri No Chundo can be made even though it's raining cats and dogs outside. Just grate raw mangoes , add sugar, mix it and put it on the stove, check for 2 thread syrup, add spices and voilà..you will have delicious and wonderful instant Keri No Chundo in no time. Keri No Chundo is a great accompaniment to so many things, and this Chundo transforms an ordinary meal into something special. Also Gujju goes crazy when you serve with Poori, Paratha or Thepla. 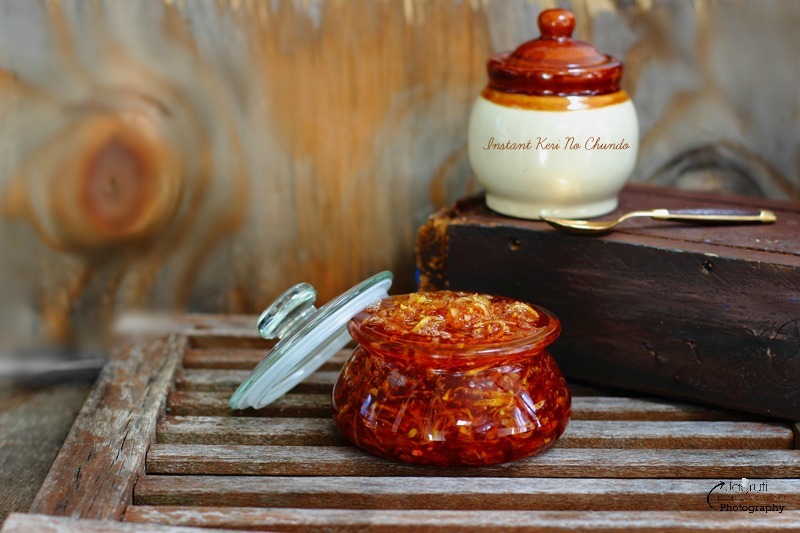 This gorgeous and sensational Keri No Chundo can become a delightful gift for the ardent pickle lover or many senior citizens who are living on their own and unable to make it. Add salt on to grated Mango and leave it for five minutes. Add grated mango and sugar and mix well. On a medium heat keep cooking and stirring until the sugar dissolves. Continuously cooking till you get 2 thread sugar syrup. Switch off the heat, add red chilli powder and cumin seeds. Mix well and let it cool completely. Once cool store in a sterile jar. My favourite pickle always your recipe sounds so perfect and the clicks are so tempting. Thank you Soma :)Glad you like my recipes. Lip smacking. My mom makes something similar to this but using Jaggery instead of sugar. Loved your version.. super quick and yummy ! Delicious pickle.. I have lots of raw mango in this season. Will try this out.. Delicious. I want to know if the jar in the pic is all the chundo you made? Or there was more. That looks so mouthwateringly delicious Jagruthi. 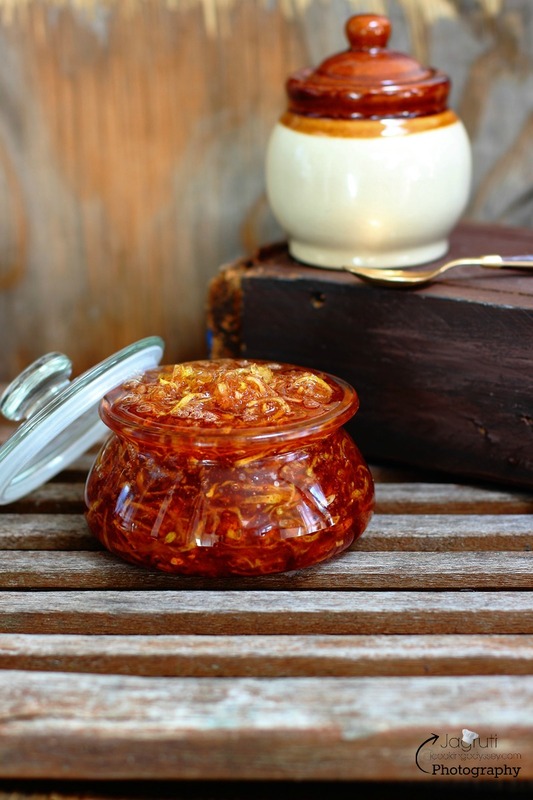 Anything with mango is welcome in my home and this sweet, spicy and sour chutney will be LOVED for sure. 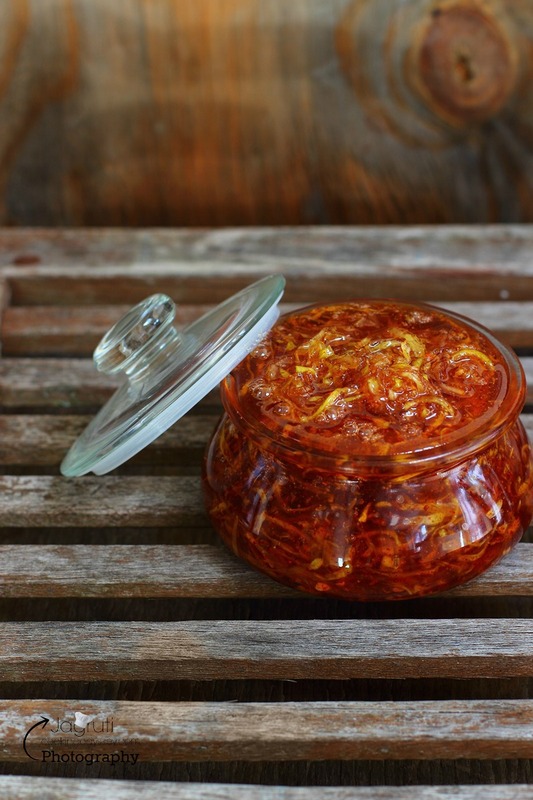 Love this Gujarati gift to the pickle world; the sweet, sour and spicy combo is awesome with any dish! Fabulous clicks, makes you want to pick the jar from the screen! Such a delicious looking pickle. Even my mom prepares various types of pickle as soon as raw mangoes are in the market and yes, she prepares by instinct. No notebooks, no weighing scales. Just pure magic of hand. Instant Keri No Chundo, is an awesome recipe, I have tired this instant chundo by last summer, planning to prepare for this summer too.. your post is really wonderful, and in our childhood too me and my cousins will voluntarily involve with grandma to make mango recipes. 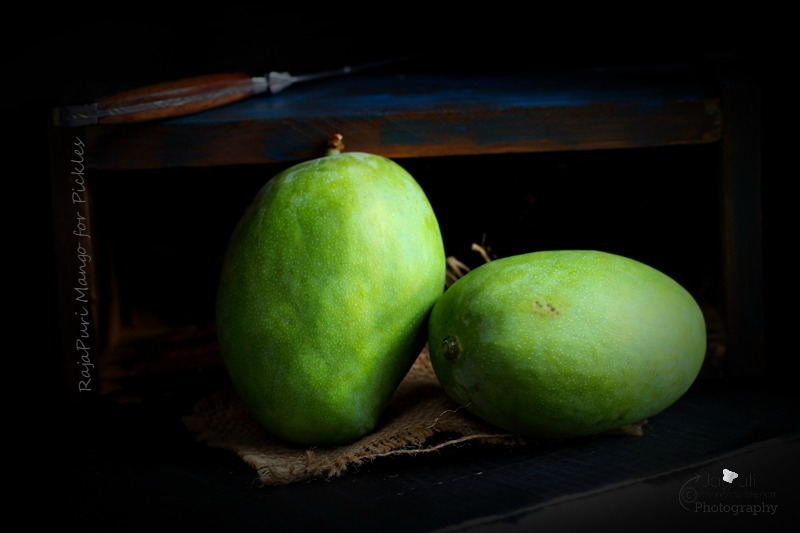 since mango season comes in summer vacation we have a fun filled vacation in grandmas house.. Your post reminds me all my childhood memories.. . Whenever my mum used to put the mango sugar out in the sun, my brother and I would wait for her to take her daily nap. We'd slowly untie the string, lift the cloth and eat the mixture. Of course she would wonder why the mixture looks less! I prefer using the instant method of making chundo. I love this pickle the best. Beautiful photos. Thanks Mayuri! We were the same :) I guess we did not have fancy chocolates and cakes in our time! I enjoyed rreading about your mum. She sounds just like mine. Never needed recipe books or weighing scales. In fact Amma could eat just a piece of something n name ingredients n tell me how to make it. Miss her. Chundo looks yum. Now that you have mentioned must start making it. Pickles are always drool worthy:) sweet and spicy combo is my favorite! I will look out for raw mangoes! I am a big fan of pickle. Specially mango pickle. Never tried this version. I am surely going to try this :) Thanks for the share! My mom used to make this the traditional long way. she will love this instant version. Oh gal, this chundo is seriously highly irresistible, cant take my eyes from that fabulous looking chundo. My mouth is just watering here. 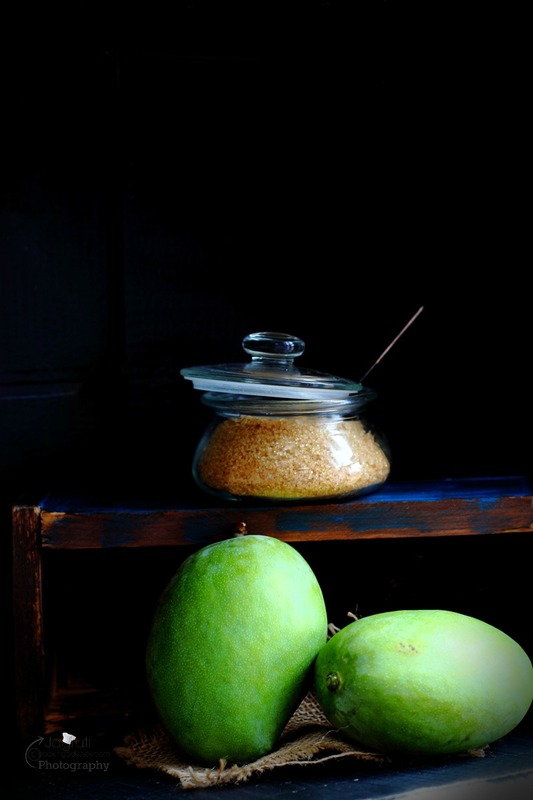 Rajapuri Mangoes are the perfect mangoes for this pickle. I simply loved it the moment I saw it on FB some days ago and pickles being my major weakness and love both, cannot resist! Best pickles comes without measurements or weighing scales. Eyeballing the ingredients, loads of love and care makes the best pickles. Your mum and mine absolutely did the same and that is the reason we both turned out amazing cooks. Loved the recipe and hopefully I make it this year especially for husband who loves it along with Methi theplas. I do need to try this one, love chundo, but never tried making it. I love this chundo with paratha or poori. This exactly look like the one my naniji used to make for us. Such a bringh color, mouth watering just by looking at it. I loved your mini berni. Yes,mom never measure ingredients and the dishes turn out awesome! Nice post Jagruti. More than the method, I was drooling over these gorgeous clicks! I absolutely love chundo and am so happy to have this authentic recipe. Your description of summers in India is so vivid. Enjoyed reading the post!